Inspired by Michael Pollan's excellent Cooked, in which the author spends many pages describing his efforts to make Chad Robertson's levain bread, as chronicled in detail in Robertson's Tartine Bread, I decided to try again to follow Robertson's 50 pages of instructions on making basic country bread. The secret of Robertson's bread, and the reason it is so difficult, is that you must first make a levain starter, for this bread is made without yeast, apart from that which appears by serendipity in the starter. 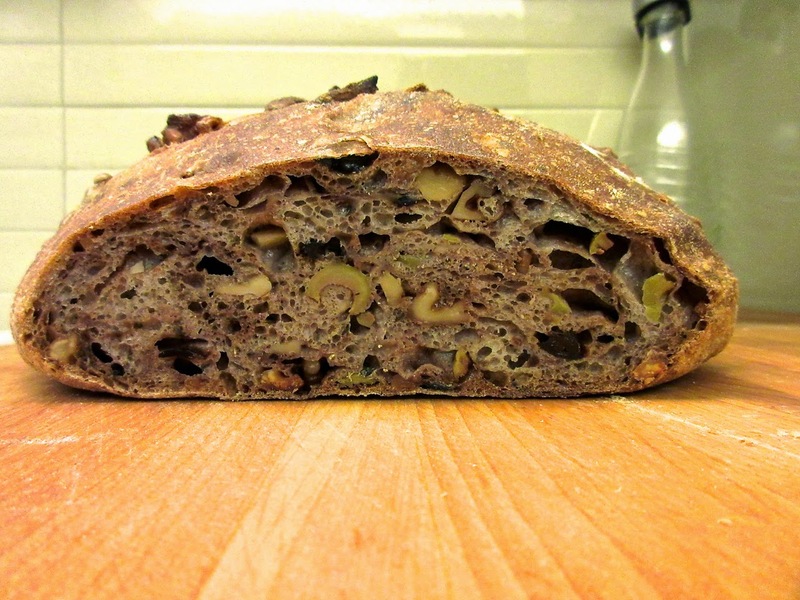 Levain is like sourdough but -- guess what! -- less sour. 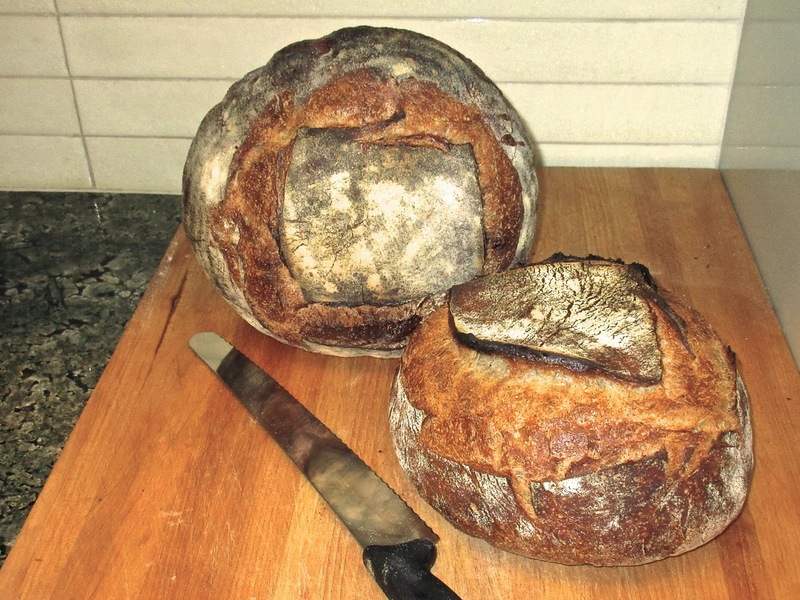 A couple of years ago I spent months trying to use levain starter in conjunction with Jim Lahey's brilliant, easy and foolproof no-knead bread, which I have discussed before. I never could get the oven spring that I wanted (i.e., the loaves were too flat) without adding just a smidgeon (1/8 tsp) of yeast, but that was cheating. 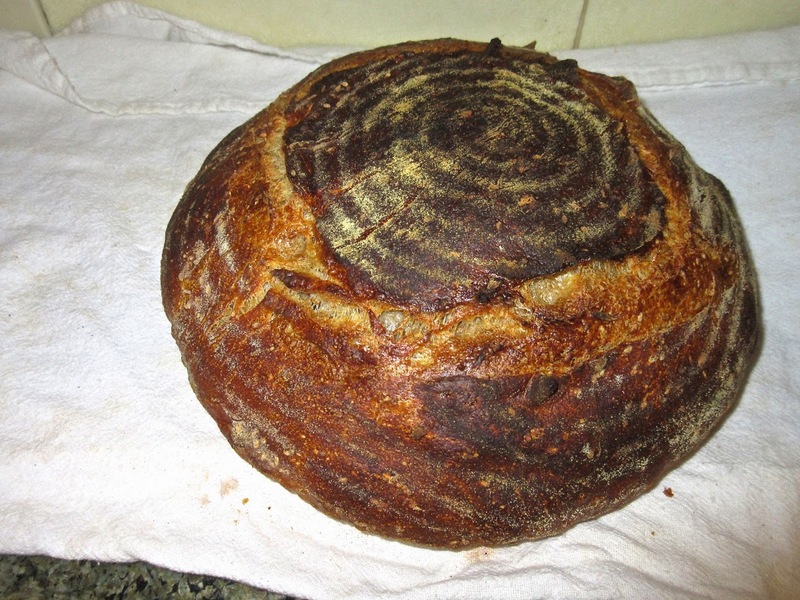 When I went for the full Tartine bread, I still did not achieve the oven spring I wanted. As noted above, I tried again, but this time I could not get the starter to start. A disgusting mess, which is fine, but without the bubbles, which is not. In frustration, I got the (pretty brilliant) idea of buying sourdough starter from King Arthur Flour, which I fed a few times according to their directions and then transformed into levain starter by feeding it as Robertson suggests. This worked and in a couple of days I had a very vibrant starter ready to go. Now all I had to do was spend the next 26 hours following Robertson's recipe. You feed the starter and turn it into levain overnight. Then in the morning, when it is ready (a little bit of it will float in water, but mine took an extra 2 hours), you add water and flour to make dough. After a short rest, you add salt and a bit more water and leave for 3-4 hours, the "bench rest," folding (not kneading) the dough in the prescribed manner every 1/2 hour or so. Then shape the loaves and leave for another 3-4 hours. 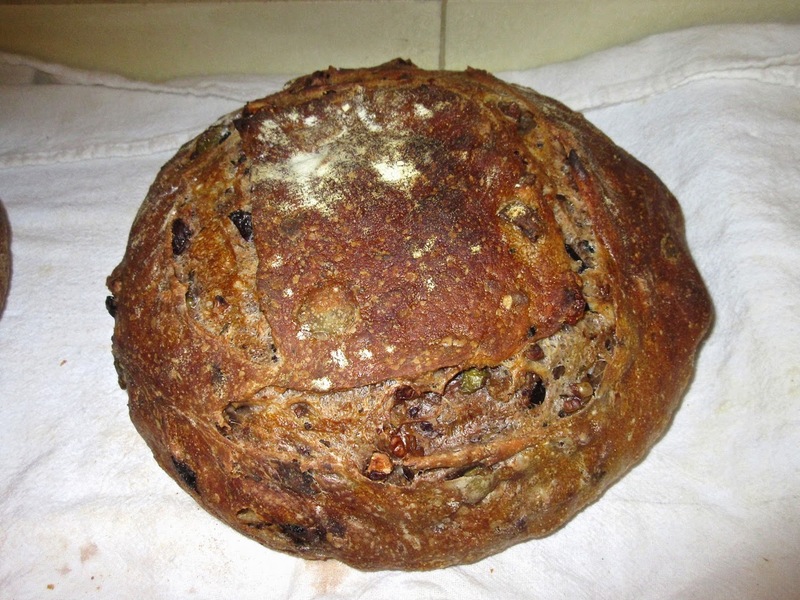 Finally, place a loaf into a covered dutch oven at blazing high heat for 20 minutes, followed by 20 minutes uncovered . . . and then you have bread. And what bread it was! Gorgeous, beautifully colored, soaring, with a perfect rustic crumb and a slightly sour, almost bitter note playing against the sweetness of the wheat (about 22% whole wheat, in case you're curious). The bread was light, but less so than Lahey's, and with a more substantial structure. 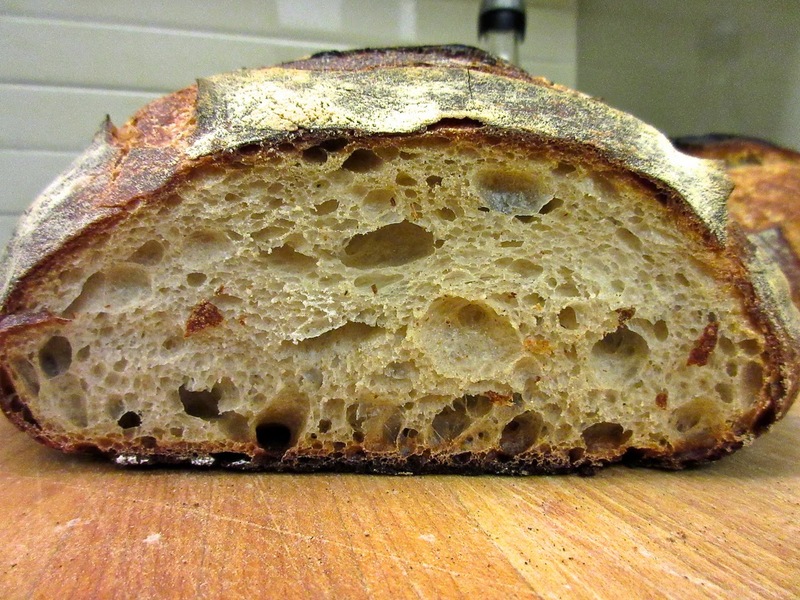 I was thrilled that my project had worked, and the bread was one of the best I have ever eaten. But it is a lot of work . . . well not so much work, although some technical skill is required, as being there -- a lot. You can go out, you can delay baking by refrigeration and other techniques, but you still have to be around. Is it worth it, given the degree of difficulty and time management compared to Lahey's no-knead bread? Hard to say, but I will definitely be doing it again. But then, I am retired and projects like this are my "bread and butter." 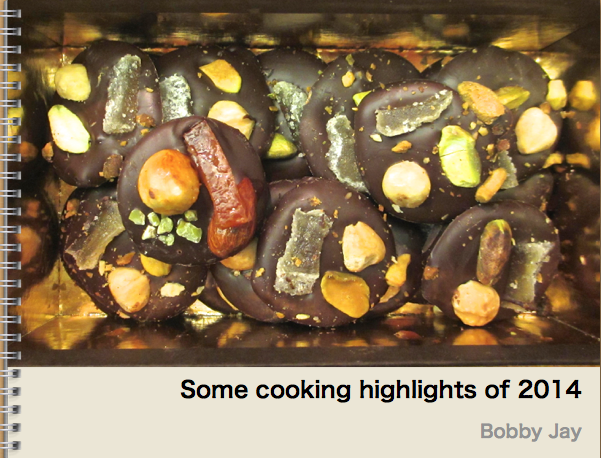 I have made an iPhoto book of highlights of my cooking year. To see it, click on the cover page below. Unfortunately, you won't be able to see side-by-side double pages, so some of the text may seem a bit misplaced. I am working to solve this problem, but for now . . . . Recently Nadège, the most loyal follower of my blog, recommended that I watch some short cooking videos by Alain Passard. They are terrific, and more on them later. Passard is the chef of the famed Arpège, in Paris, where the spectacular and spectacularly expensive food is mostly, but not exclusively, vegetarian. A number of years ago, J and I went to Arpège with our good friends H and O and had a wonderful meal, but . . . we really felt ripped off paying nearly 300 euros per person (it's more now, of course) for the meal and we also felt that the restaurant's staff made the experience about them, not us. Yet I have to admit that I can still remember the taste of his most famous creation, a dessert consisting of a tomato that is confited for the better part of a day. 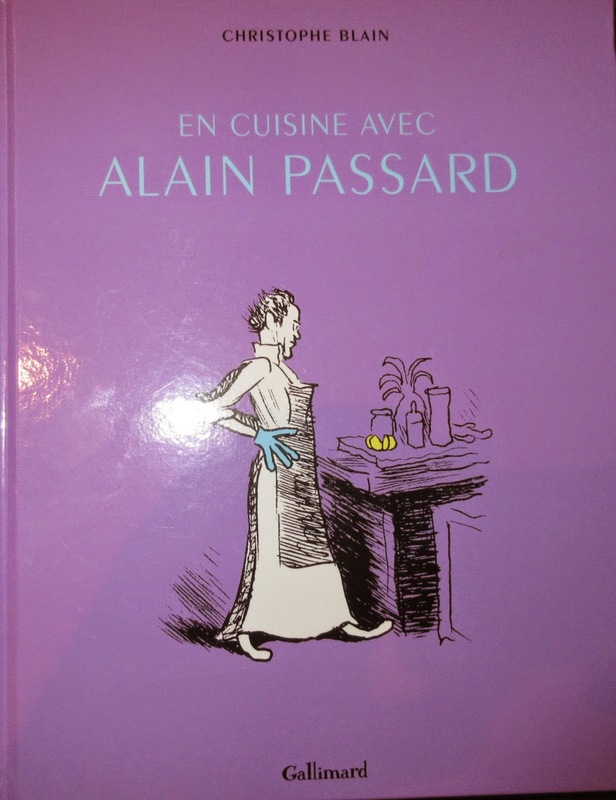 I thought nothing more of this until I happened upon a bande dessiné (graphic, comic-like book), En Cuisine avec Alain Passard, written by a journalist who got to spend a lot of time with him. Reading this book gave me a new respect for Chef Passard. He sources nearly all the vegetables he uses at one of two organic farms that he owns. One is more or less conventional, the other uses horse-drawn plows and ancient planting and harvesting techniques. He tries growing the produce at each farm and then chooses the one that give the best result for future production. And he is a workaholic, spending virtually all of his time at the restaurant, creating, sampling, creating, etc. He has decided not to expand like other chefs because he cannot imagine producing the level of cuisine that he produces at Arpège without personally supervising every step. The level of Chef Passard's attention to detail is pretty amazing. There is one problem, which you may have suspected: the lessons are in French. The language used is not difficult, and the videos are so well illustrated that they are easily followed, but the fact remains that they are in French. Still, I encourage you to give them a try if you have even a little French and love to cook (or eat). Just looking at what he produces will be an inspiration. Will I go back to Arpège knowing what I do now? I'm seriously thinking about it.